CSEA Chapter 296 members from top left to bottom right are: Debra Ramirez-Secretary, Helena Perkins-Site Rep Coordinator, Ernesto Maldonado-Chapter member, Eva Garcia-Chapter member, Astrid Cante-CPRO, and Aracely Barajas- Chapter member. Classified employees from Chapter 296, Palmdale School District are proud to present their choice of candidates for the upcoming elections for Palmdale School District Board of Trustees. Classified employees are the front line to serving the kids of PSD. Our children interact and depend on classified employees on a daily basis. Who are classified employees? 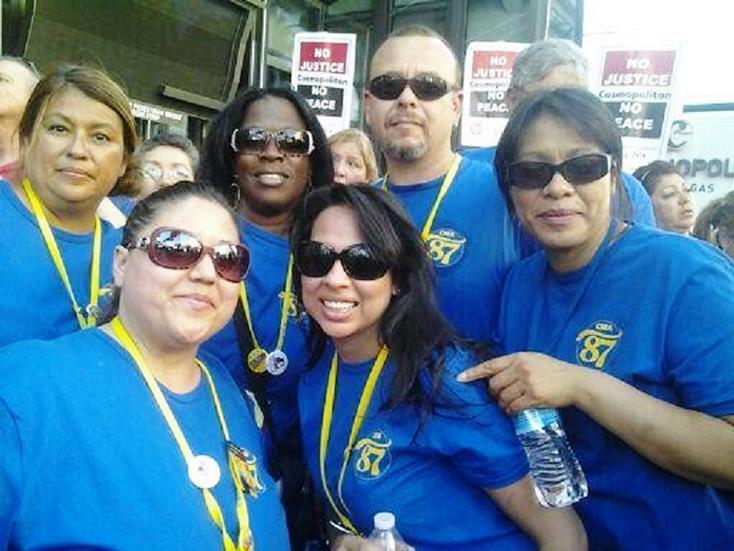 They are the bus drivers, cafeteria staff, playground aides, custodians, health aides, library aides, computer technicians, school secretaries, administrative clerks, special education and teacher assistants, para-educators, payroll, benefits, and accounting technicians, enrollment clerks, family community liaisons, and LVN’s. Classified employees are dedicated to serving the children of our community as well as ensuring that they are well taken care of everyday of the week. It is because of this dedication that the classified employees of PSD seek to make a change from within. The classified unit has taken the brunt of the cuts the current board of trustees and superintendent have approved for the past 10 years. No PSD employee has seen a cost of living raise in that amount of time (or more), and classified positions have been cut year to year, taking services away from the schools your children attend. On Thursday September 26, 2013, the classified members met to vote on candidates to endorse. There are three seats open for election and 11 candidates. The choice was not easy, as there are many people who have demonstrated true interest in representing the classified unit. Our members chose to endorse Nancy Smith, Don Wilson, and Juan Carrillo. Nancy Smith has a long and rich history in the Antelope Valley and within Palmdale School District. Mrs. Smith has lived in Palmdale for 30 years, raised three children who became successful teachers and has grandchildren who currently attend PSD. Mrs. Smith was once a classified employee and even served as PSD superintendent; she is not only personally invested to teachers and classified employees of PSD but also has a deep understanding of finances and negotiating that PSD employees need in a board member. She is a strong woman and a true leader who we believe will make a positive impact and difference. Don Wilson is also personally vested in PSD, as his wife is a teacher in the district and his now retired sister was a classified employee as well. Don not only attends board meetings, but is always willing to ask the tough questions at every meeting he attends. Mr. Wilson has spent countless hours learning about what goes on with PSD, and is more than ready to learn about our classified unit. He is a resident of our community who cares about children’s education and understands that classified employees are an intricate part of their success. It is his strong voice, caring disposition and presence that won the vote of our members. Juan Carrillo is a current PSD parent, who has seen the changes and cuts that have occurred during the past few years. Mr. Carrillo understands that these cuts in salaries and staff affect children’s education, and it’s the reason why he has chosen to run for board of trustees. Mr. Carrillo seeks to make a change in the way PSD treats its employees and is just as willing to invest the amount of time necessary to protect our jobs and salaries. Chapter 296 is confident that these three candidates will be the right voice for our unit and our children’s education. They understand Palmdale, education, and Palmdale School District as they are life-long residents and plan to remain members of this community. Their attachment and devotion to Palmdale School District is clear and our members look ahead to a positive and fruitful campaign. 17 comments for "Classified employees endorse PSD Board candidates"
I will call AV Press today and cancel my subscription! How bout AV Times? When are you going to step up to the plate? Well naysayers, you asked for Don to clear the rumor and he has. That’s trustee material. Who do you trust now? Yep…that’s how you play the political game. Great job! @AV Times…why no updates on PSD Board and Gallizzi? @Bill…Peta and Csea both endorsed Smith & Carrillo. Peta endorsed Ricks…flip a coin and hopefully Wilson is heads! Gabie, I’m curious. Did you hear this directly feom his wife? Or from someone else? And am I right to assume you’re a PSD employee and union member? When did his wife say this? You are clearly posting unfounded and untrue information. If you aren’t willing to back up what you say, please keep rumors to yourself. I am not the only one saying this. I have heard this from numerous other people. I know someone who works with his wife, and I will leave it at that. Mr & Mrs Wilson need to either admit or squash the rumor. It’s called polotics, and they should know how to play! Gabie…in other words, you are just spreading rumors!!! How can someone who is married to a long time teacher not like unions, when they have benefited from union bargaining for so long?! It just doesn’t make sense. It seems you are easily convinced by what other people say. Lucky for us, we are true leaders who investigate such claims before making them public and you have nothing to do with us. I have a question for Curious. You obviously seem to be a Csea leader. Why does CESA support Mr. Willson, when the teacher’s union does not. It seems they know something that you may not. Maybe you are not the great investigators that you think you are. I do not know if Mr. Willison is against unions, but this is a question I would like answered. Our classified unit is free to choose who to endorse devoid of anyone’s influence. Our union is member run. All candidates were invited and those who accepted our invitation were given the floor to speak to our members. It was based on those meetings and information we provided to our members, that these votes came about. With that said, we believe Don Wilson has shown genuine interest in learning more about classified employees, and is very willing to work with unions. I have discussed this issue with him and he is open to have anyone contact him to deter any doubts about his intentions and current beliefs. We are well informed of our candidates past, present and future with unions and our school district. We are also not afraid to question and will always share any information we have with our members. I support hard working men and women regardless if they belong to a union or not. Union workers are the heart and soul of the union; just as voting citizens are the heart and soul of the United States. We are only as good as the people we elect. I have only recently become familiar with CSEA-296 and frankly I am very impressed with the membership and your executive board. During the contract debacle I was so impressed when membership voted to take the pay cut because it would save classified jobs. During this campaign all eleven candidates were given the opportunity to speak at a CSEA-296 meeting and answer questions. This allowed every worker to have a direct voice in the endorsement process. Up to this point my main contact with the executive board has been Astrid Cante, Falicia Foster and Dale Speights. They are delightful to work with, very professional, kind, patient and supportive. I deeply appreciate their leadership and the CSEA-296 endorsement and I look forward to walking precincts with CSEA-296 members. I have a posting on the CSEA-296 Facebook page that elaborates on my position regarding unions. I look forward to your comments. Nancy Smith can turn this district in a new direction. The funds are there and she will hold Gallizzi accountable. She does have past history herself of unhappy staff & parents when she sat at the helm…hopefully past practice has made her wiser. Good or bad the current board members are useless puppets…a clean slate is the only option. Trust is a hard thing to earn back. We do work hard too. I appreciate all the hard work that we all do for our children. I’m tired of taking cuts….. I’m tired of always giving and giving! Enough is enough! csea lets stand together.